It’s the darndest thing: sometimes you just lose your nerve. Not necessarily because anything dramatic happened. I think it’s usually something, but it can be something small. Somebody looks unkind, or you make a mistake that is easily rectified with no harm done, but suddenly you look around yourself and say that’s it, I’m done. I’m not moving this boat another inch. Well, maybe far enough to get to shore. But that’s it. In those times, you would swear that it’s truly done. That there is no more stuffing for carrying on. And then, after a bit, the funniest thing happens: you get some rest, some things go better than they did in the previous attempt, and suddenly it feels like time to go sailing! The transitions are extraordinary, in both directions. I just spent several days anchored near the mouth of the Jones River, which opens into the Annisquam. It’s very beautiful – the site of all those lovely grasses. But it’s tricky for anchoring, with current and a bottom that slips, moving anchors in the night. And there are a disproportionate number of grouchy people. Admittedly I should have run the anchor light every night that I was in there. I have a perfectly lovely anchor light from Bill, taking the place of the one at the top of the mast that stopped working after the first month of this trip. But the first night there were fantastic stars, and no traffic whatsoever, and it was unclear whether I was technically at the edge of a mooring field, with a float house about 80 feet away and mooring buoys beyond that. The second night there was some traffic, and after a bit I went out and set up the light. I do like to skip the light when I can, because the darkness, and the stars, are so sweet. The next morning started first with a person in a motor boat, who seems to go out each day to give her dog a run along the shore, as she drives along in the boat. We had said hi a couple of days before, and this time she stopped to talk about the anchor light. Funny, because a man in a motor boat early in the night had said specifically oh I can see you, you don’t need that light, when I went to put it up. He said he used to have a float house in exactly that spot, and that it was the best place in the river to be. This is a jumbled story, because it was a jumbled time! The next thing that happened in the morning was that somebody from the harbor master’s office (the boat said harbor master, but not which town) came to speak to me about the anchor light subject and to ask in a rather unwelcoming way how long I was planning to stay. He said that this was not in fact a mooring field, but a federal waterway. I said I’d like to stay until Sunday morning (this was Thursday), if that was okay, waiting on the wind. In an unencouraging way he said that would be all right, and he would speak to his boss. When the harbor master boat had arrived I was in the process of setting a second anchor, Bahamian style, so there would be one anchor for each direction of current flow. The morning when everybody wanted to speak to me about the anchor light I had been up at 3 AM hauling and resetting the (single) anchor because it had moved too close to the sandbar side of the creek and the boat was just ready to go down on the bar in the dark. I wasn’t excited about the possibility of going over at 30° when I couldn’t put all that effort to use to clean the bottom of the boat! So the grouchy fellow from the harbor master’s office said it would be okay for me to stay there so long as I left a path for people to get by in other boats. (This was interesting because AUKLET really isn’t big enough to block much of anything…) About the time I was pulling up the original anchor, to put it in a better spot after having set the second one, a couple of older fellows were going by in kayaks. I said to them “anchors sure do move around in here!” In Maine I had had no problem whatsoever with the anchor turning when the tide changed and resetting in the mud. Here, in the sand, there seems to be migration on every tide, and last night this had involved migration to the side, which didn’t work out so well. The man in the first kayak said in a particularly grouchy voice “yes, they do.” Though the fellow in the second kayak had a more friendly expression on his face. Later still that morning another older man went by in an open motorboat. He looked downright hostile, for no apparent reason. In Cutler people took a long time to warm up to somebody, but eventually about half of the lobster folks started waving to me. And even in the beginning, though they were definitely not friendly, they didn’t look aggravated – just rather cold. Here was a different story. I still don’t understand what really happened in there. I’m in the habit of occasionally staying someplace for several days. I do this partly to get some rest, but also because it seems like by about the third day people start coming to talk to you. Friendly people, who want to say hi. I like that, and it inspires me to stay around for a bit if a place is nice, just to provide for a chance for those conversations to happen. That was sort of what I was up to, staying in the Jones River like that, but what an opposite outcome! So maybe it’s territorial, and maybe it really did provide navigation complications, where I was anchored. But there did used to be a float house there – just like that man told me – and it’s not like I was in a working thoroughfare. No lobster boats passed, and the boats that did go by were not blocked by my presence. Maybe people were angry because I had let the boat dry out on the sandbar earlier in my stay, and had since been swimming around scraping and scrubbing. Whatever was happening, it was surprisingly inhospitable. There were a few people who were nice, but in all these travels I haven’t encountered anywhere with so many people being specifically unfriendly in such a short time. So this morning (Friday) I left. After umpteen phone calls related to hauling the boat and trying to get the junk off the bottom, plans were clarified. My destination, rather than the Merrimack River, has become the Danvers River, north of Boston, but on the south side of Cape Ann. This change in destination meant that a north wind was my ticket, rather than the south wind that had been forecast for Sunday. With a light north breeze and later some rain, I was off. Which brings me back to the subject of nerve. A few days ago I had no nerve left. Yesterday, the same. But this morning the two anchors had worked, and something changed. When the tide was almost low and I checked in the night, the boat was just where it belonged in the deep channel, and I went back to sleep. When I woke up at 5:30 something in my outlook had shifted. It was good to go sailing, even though I had to go through two drawbridges. It’s such a funny thing – you lose your nerve, and you would swear it’s never coming back. It’s unclear why it went away, but it’s definitely gone. This has happened once or twice on this trip, and it happened a few times last year, also. Each time it has had the rocksolid feeling that it will not change again – that the muscle that makes it possible to do a trip like this is simply finished. At least this time I’m in Massachusetts! It has some complications if you feel like this 300 miles from home. Of course the obvious thing to do if you feel like you have no nerve to continue is to stop moving. Which is what I have done each time. And then the miracle happens: one day, you wake up, and it suddenly looks simple to put up the sails and venture out again on the wide water. I don’t count on this happening – each time I stop, there is the possibility that I am truly done. But I have learned to not stress about it quite so much – to say that yes, I’m stopped, and I’m going to stay here and just do some projects. And I might not move the boat again. But I might. It’s an interesting process. So yesterday, that miracle of possibility happened, once again. After the phone calls and organizing it was clear what I was trying to do, and by about 10 o’clock I was headed down the river, toward the drawbridges. The bridges were an event in themselves. Sails have to be down for these particular bridges, meaning proceeding with just the electric motor once you get close. The first one went well, and then I passed the Cape Ann Marina and got to say hi to Lisa and Andrew, who had helped with the mast bolt. That was fun! At the second bridge I misjudged when to call the bridge operator, and the bridge was open before I was right there. (The photo is of the first bridge – I was not busy taking pictures while going through the second one!) That second bridge is small, and goes up faster than you would ever think, compared to all the others I’ve been through. It fools me every time, and the bridge operator was not happy. This time in the river has been so filled with opportunities for study! But then, there you are, still in your boat, and even if you didn’t do it perfectly, the overall effort somehow still seems doable. 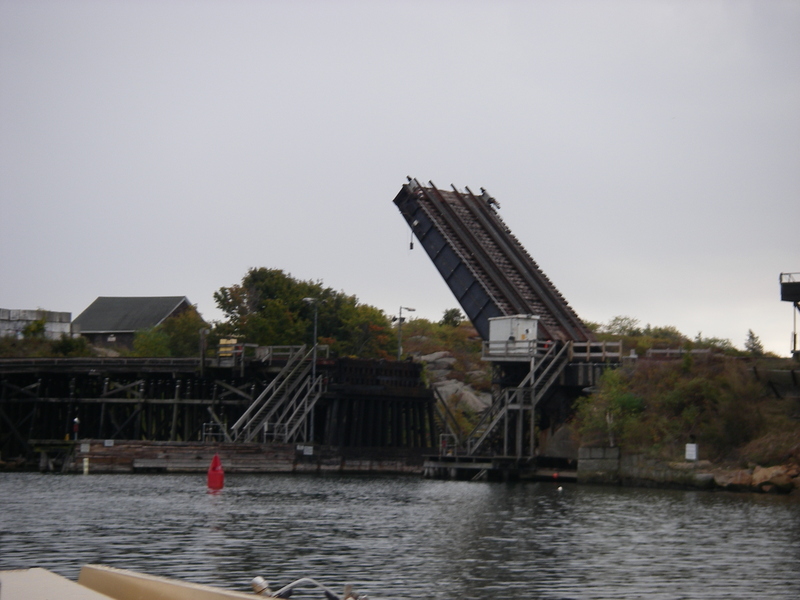 By the time I came out of the second drawbridge into Gloucester Harbor, the open water looked perfectly inviting. Motor off, sails up, and the wide expanse of Massachusetts Bay up ahead. A few hours sail, and now I’m at a lovely cove at an island off of Manchester, Mass., the only boat amidst about three dozen empty moorings. The funny thing about this place is that the name of the island is Great Misery. Regardless, I’m hoping for a nicer time! Enjoyed the blog entry. The grouch insets is nothing personal–I’ve lived in Annisquam 15 years and have always been surprised at Howe unfriendly the Gloucester area is. These are generally tough folks for whom social niceties are not important. If you’d stayed in the Jones River people would have warmed up, after maybe a decade. Thanks so much for your thoughts on this! It sure is an interesting area. Some folks were hugely friendly, thank goodness. And it’s so incredibly beautiful that I expect I’ll be back. It’s great to have all the feedback, to have a little more sense of what’s going on.